One major problems owners are facing is the lack of available design professionals to do their projects. With a massive number of hotels either being renovated or built, designers are over worked, over stressed, and just plain over it. Not that they’d prefer to go back to sad and scary days of 2008 anytime soon. However, this problem is causing owners and operators numerous headaches as they’re forced to pay more for projects, or suffer long delays to completion time, or both. Nearly 30 years after reinventing the Las Vegas casino concept with The Mirage, he’s still searching to create the perfect casino project, which he hopes to achieve with the under construction Wynn Boston Harbor project. 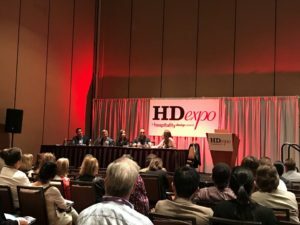 During a keynote discussion during HD Expo, Steve Wynn and his design partner of 37 years, Roger Thomas, revealed the secret to consistently creating memorable designs. “We first ask what is the statement we want to make when the visitor is out front, then we design to emotion and not materials. We don’t care if it’s onyx or marble because we do not design to budget. We design to how it feels” said Wynn. We learned a new term; Biophilia. It’s not a dirty one, though we think it should be. Biophilia refers to humankind’s innate desire to connect with the natural environment. It’s an understanding changing the way hotels, and other structures, are designed. “It’s the idea of what happens when we connect people with nature as an economic driver,” said Joshua Radoff, Co-Founder & Principal, LEED AP BD+C, YR&G, a sustainability focused consultancy. The concept is informing design with new environmental standards, such as the ones adopted by the LEED certification program, as well as through the inclusion of nature first elements such as water features and green walls. These elements lead to higher customer satisfaction and increased profitability. More and more, we’re seeing hotel companies take a conscientious approach to sustainability. FF&E purchasing pros regularly look at the entire manufacturing process now when determining the viability of a product. And more frequently, they’re eschewing buying new in favor of refinishing or reengineering existing furniture pieces. The move keeps tons of material from taking up valuable room in landfills, while also saving hoteliers up to 80% when compared to buying new. It’s the smart way to save without being stingy on guest experience. For more information on The Refinishing Touch and how we help designers reimagine spaces by reinventing their furnishings, contact us at: (800) 523-9448 or via email at sales@therefinishingtouch.com. With that notion in mind, a group now looking to minimize its contribution to landfills is the business community of the Las Vegas Valley, which is making determined efforts toward zero-landfill waste — or reducing the trash they contribute to landfills to as close to zero percent as possible. Sound impossible? Businesses elsewhere in the country are doing it too, or coming close to 90 percent less waste, according to a recent Las Vegas Business Press article. DuPont, for example, maker of Corian countertops, has had zero waste since last year, saving 81 million pounds of waste per year from ending up in landfills – the company grinds shipping pallets into animal bedding; it sells scrap Corian materials, which are then used to build roads; and cafeteria waste gets used as compost for landscaping at its facility. Similarly, General Motors has made half of its factories waste free so far. Leftover sound insulation, for instance, doesn’t get pitched but is sold to garment makers for winter coats, and employees are asked to take home coffee grounds for yard compost. Toyota is also working toward a goal of keeping all its waste out of landfills. Up to this point, nine of its 14 U.S. factories don’t contribute to the waste stream. As you can see, it’s a combination of big and small methods that get this goal accomplished. Here at The Refinishing Touch, we applaud businesses that jump on board to save our planet with innovative ideas that also make good, sound business sense. We are a partner in this overall effort to keep landfills from getting overburdened — and have been since 1977 — helping government, universities and hospitality industries refinish, re-upholster, and remanufacture furniture assets as opposed to buying new. And in the process of completing our environmentally-friendly furniture asset management services, we save our clients up to 80 percent in costs and 90 percent in carbon emissions. And like the efforts of our friends in Las Vegas — we are working to save the environment, one percent of waste at a time. The Refinishing Touch team has remained busy throughout the month of October – not only have we been preparing the third quarter edition of our digital newsletter, InTouch, but we’ve also been attending various tradeshows all across the nation. The month kicked off with the 10th annual ACUHO-I / APPA Housing Facilities Conference in Albuquerque, New Mexico on October 2nd through the 6th. The trade show was held at the Hyatt Regency and Convention Center (a brand we’ve worked with before), with more than 250 attendees from colleges and universities joining together to discuss sustainability. The Refinishing Touch spent most of the event networking with key decision makers and speakers, along with learning about the future of housing in the higher education sector. Several attendees expressed an interest in refinishing, one of our specialties, and it’s easy to understand why – our furniture asset management services can save up to 90 percent of a project’s estimated carbon emission output and 80 percent of a company’s budget when compared to buying new. Our next stop brought us to booming Las Vegas, where we attended the Best Western International Conference & Trade Show on October 10th. Over 2,000 owners, general managers and property management companies gathered at the conference, giving us great insight into the current and future direction of the hospitality industry. While there, The Refinishing Touch connected with potential prospects and attended a Supplier Training Course, where we learned how to navigate through Best Western’s supplier site and effectively use the brand’s templates. To top it all off, the event raffled off 65 Apple iPads and several other great prizes. If that weren’t enough, next we headed out to BITAC West at the Hyatt Regency Resort and Spa in Indian Wells, California. While there, our team held 22 face-to-face meetings throughout two full days. Over the years, we’ve found one of the most rewarding aspects of tradeshows is being able to convey the benefits of our sustainable furniture asset management services to past, current and potential customers, alike. During the second day of the three-day event, The Refinishing Touch president and founder, Mario Insenga, gave an informative speech during lunch hour. Our favorite line was, “Remember: the last three letters in trend are ‘e-n-d’”. This couldn’t be more true of the hospitality industry, which has seen its fair share of trends come and go, especially through the recession and recovery. Were you at any of these trade shows during the month? We’d love to hear your thoughts and takeaways! Send us an email at sales@therefinishingtouch.com. For future event listings, be sure to subscribe to our newsletter by visiting: https://www.therefinishingtouch.com/news.php. The next edition is coming soon! We’ve been talking a lot about the events that we’ve had the pleasure of attending these past few months, and as you may have guessed we view and value each one as integral methods for us to stay on top of emerging trends and hot issues, reconnect with fellow colleagues in the industry and forge new relationships. This week, the TRT team headed west to Las Vegas for the BITAC Purchasing & Design West convention at the Red Rock Casino Resort & Spa where we were able to mingle and learn from many of our fellow industry suppliers and decision makers that added up to the sold out crowd of the more than 300 attendees. One of the things we’ve come to love and expect from BITAC events is the never failing stimulating agenda packed with speakers and panel members, and this year’s West Coast event was certainly no exception. Led with thought provoking interactive sessions throughout, the conference offers invaluable relationship building opportunities through endless opportunities for face to face meetings, an open marketplace and a diverse dining format that kept us on our toes. We had a chance to catch up with fellow lodging executives and suppliers early in the week and were treated to sessions including panel discussions on everything from some of the world’s largest hotel brands backing renovation efforts to the nightmare scenarios that both buyers and suppliers have been faced with since the recession hit and how new signs of life are starting to make their way back in to the picture slowly, but surely. Bruce Ford of Lodging Econometrics gave an industry report on the state of the lodging and hospitality industries and where we’re headed and further panel discussions revisited the ever-popular green design element where we saw great progress. Designers have begun looking at new, more innovative ways to address the financial concerns of the owners they are catering to. BITAC is always a fantastic stage to reconnect with many of our current customers, rekindle past relationships and forge new ones as another year begins to wind down. It was a very successful event for TRT and we look forward to seeing “pens put to paper” with the overflow of great ideas that came from all of the discussions had amongst some of the industry’s finest.